On Friday I ran a sketching workshop for 28 lawyers visiting Edinburgh from the Netherlands. My sketching two hour workshop was a break from their talks and visits to Parliament House and the Supreme Courts. 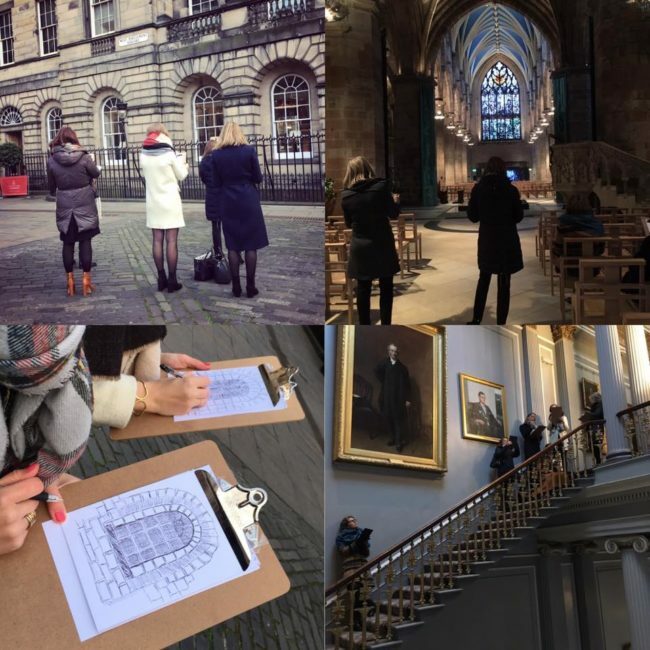 Blessed by such stunning architecture we sketched both the Georgian interiors of the Signet Library and exteriors, before visiting St Giles Cathedral for a little perspective practice. Capturing the dark and light inside St Giles Cathedral was a real challenge, and using that shading to create depth in your drawing can be a tricky but rewarding task. My group created a number of drawings around Parliament Square, and the two hours passed by quickly as each person found a little peace and creativity in their otherwise busy schedule in Scotland. If you would like to discuss booking me to run a workshop for your visit to Edinburgh, or business conference then do get in touch. Sketching can be the perfect stress free distraction between meetings, when total concentration can be achieved quickly.